The Skinny: Classic martial arts tale from King Hu. Widely considered one of the best Hong Kong movies ever made. I liked it. Thanks to the deep pockets of Celestial Pictures, the massive catalog of Shaw Brothers films are due to be released on DVD. What that means is ten DVDs a month of old HK Cinema, remastered and restored for everybody's favorite digital format. Old flicks are on tap, made by the likes of King Hu and Chang Cheh, and starring people like Cheng Pei-Pei, David Chiang and Ti Lung. There's even a Wong Jing film in there. It's like heaven. Many of the to-be-released films have been touted as classics. That may be true for the heavily initiated, but there are probably many interested newbies who would like to check out these flicks but have no idea what they're like. I would have to count myself among them, as my HK Cinema knowledge involves names like Stephen Chow, Wong Jing, Ekin Cheng and Maggie Cheung. The worlds of Chang Cheh and Lo Lieh mean little to me, so this is a golden opportunity to answer that eternal question: are these films really classics? And will a person weaned on Drunken Master II and Comrades, Almost a Love Story find any of this stuff good? Considering King Hu's Come Drink with Me, I would have to say yes. Considered a classic of the genre and a seminal woman warrior flick, it stars Cheng Pei-Pei in one of her career-defining roles. She plays Golden Swallow, who attempts to free her brother from the clutches of a band of evil thugs. They want their leader freed in return, but a deal isn't initially forthcoming. 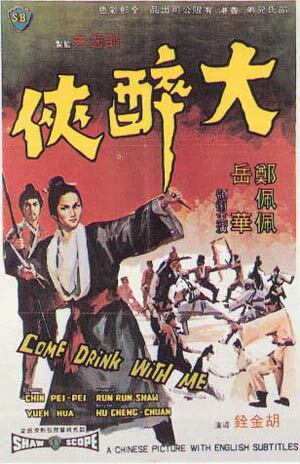 Swallow is aided by Drunken Cat (Yueh Hua), an inebriated beggar who's actually a kung-fu master. Fighting ensues. The action here isn't of the Ching Siu-Tung fast-motion variety, nor is it cartoonishly choreographed ala Jackie Chan. Instead, it's exactingly staged, beautifully framed, and artful in its perfectly-timed rhythms. The action here resembles the work of Akira Kurosawa, in that it uses stillness as effectively as it does motion, and presents action realistically, but with a stylized cinematic edge. The swordplay in Come Drink with Me looks like you'd expect real swordplay to look. The action compensates for the fact that the plot is no great shakes. It's your standard good guy vs. bad guy stuff with a female fighter thrown in for extra spark. That said, Cheng Pei-Pei is quite lovely (and young) as Golden Swallow, and handles the action sequences with great dignity. Likewise, Yueh Hua shows good presence as Drunken Cat, and the cinematography dazzles with its vibrant color and gorgeous scope framing. For its time, the film was considered a revelation in martial arts filmmaking, but even now it holds up incredibly as just a well-made film. It wouldn't be a stretch to say that it plays better now than most of Hong Kong's early-nineties wuxia do. This isn't to say that Come Drink with Me is inherently superior to all of the films that it preceeded. It's really hard to make that sort of qualification. Whereas some critics (including Paul Fornoroff) state that they prefer Come Drink with Me to Crouching Tiger Hidden Dragon, it's likely that some modern audiences would disagree. There is some truth to the fact that CTHD is a more emotionally satisfying kung-fu epic. The film features pronounced melodrama and a tragic love story, which heightens the appeal to modernand Westernizedaudiences.